You may not call the way I praise the high praise just because I choose not to replace my real place in the realm of praise to pray ace. 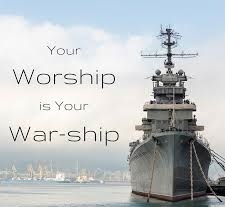 Imagine a fellow sheep in fellowship coming with a war ship into the realm of worship. Great fools that choose not to be grateful. God making their tank full, yet unthankful. Not in the starvation of salvation, yet, taking foregranted what grace afore granted. Not knowing what to call a tune since we've got caller tunes that mellow down the melody from above down, in order to inhabit a comfort which has not yer come forth. They grumble in the place of worship as if to a God of grumbling. They gamble into praise as if to a God of gambling, forgetting that God's throne is the seat with no deceit. A fake worship to an Abba father who's not an Abba made; who's love is sweeter than any yogurt you got. As you can see, the reason for my grin isn't migraine but my release into real ease, to praise in this order that ensures no disorder. You got to lay that load down to download an attitude of high altitude in worship as an icon of high praise seated in worship to defeat opposing war ships.